I fell for my Palomino Quarter Horse on our first ride. He was fourteen years old and only three months prior to me owning him he had lived in Queensland, Australia. He was bred in South East Queensland and was broken in and trained to be a reiner. His manners were impeccable but he was a very nervous horse and his shying was more like a very, very fast spin. I have owned him for nearly four years now and in that time we have had our issues (big time). Most of our troubles have been with his body, joints and lameness. Also the nervousness was a little unsettling at times, things that he had seen one hundred times before, became like the big bad monster all over again. We also went through a period where he would take off through his paddock gate, kicking up his legs which was becoming very dangerous. He would nearly knock you over to get through the gate. I couldn't understand it as he was normally quiet, only having the occasional outburst but it was getting worse and happening more frequently. I have had many many months of Lucky being turned out because he was stiff or lame and have had every horse professional you can think of to see him. He has seen vets, chiropractors, masseurs, farriers and the amount of money paid out for results that didn't last was unbelievable. I also didn't understand the importance of supplements. There are so many products on the market that it all got a little overwhelming. I have always fed him herbs in his daily feed and always included glucosamine as I knew this would help his joints. But the stiffness and lameness kept happening. Then, at the beginning of this year it became all too much. After yet another bout of lameness I was ready to retire him. From January he had so many months off and nothing seemed to help him. 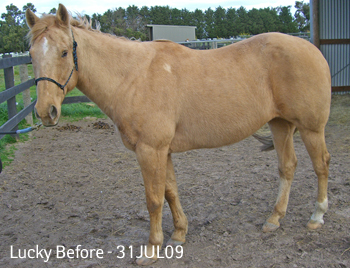 I had his joints injected with Traumeel and he was put on a herbal diet, which included ten different herbs. In June the problems got worse with Lucky's back legs giving away under him in all the gaits and cantering was a definite can't do. As soon as you asked to canter, his legs gave way and it felt like he was going to fall. No-one had any answers as there was no physical evidence of what the problem was. I talked to many friends about retiring Lucky, thinking all his problems were related back to his younger days and the amount of work he had done on his joints. Then fate certainly stepped in. A friend of mine had done some research and found Lucy Prior from Gotcha Equine who was coming to the property to assess her horses. On Lucy's first visit she witnessed Lucky's violent shying and nervousness for herself. On Lucy's next visit a week later, Lucky was at his worst and couldn't put any pressure at all on one back leg. I couldn't believe it and if Lucy hadn't been there I would have been on the phone to the vet. Lucy knew exactly what it was. There were a few main contributors to poor Lucky's problems. First, he had never been given supplements (and was so depleted in everything he needed), secondly was the grass and thirdly I made the fatal mistake of increasing the herbs. I was looking forward to starting the Gotcha Feed Plan within a week. In the mean time I thought I can't waste all the herbs I've just bought and increased the amounts and added some others into his feed for the week. I can't say for sure but by the end of the week he was dead lame in one back leg and very stiff. I now suspect that some of the herbs had enough potassium in them to just tip him right over the edge. I have to be honest... I was very weary of what Lucy told me as I had been told things by so many people over the past four years and nothing helped my boy for long periods. But seeing how distressed Lucky was I decided to follow Lucy's instructions. That was to take him off all grass and start doing the Gotcha Feed Plan with increased doses for two weeks. Within days I couldn't believe the improvement. Lucky was walking without any signs of the lameness. Lucy was on the phone to me every day and her help was invaluable. I can't thank her enough for the time she spent with me. It wasn't long and we were back to riding and his movement improved so much. There is no more galloping around the paddock or charging through the gate and he is now a calm, lovely gentleman. I really can't believe I tried so much and spent so much money and never thought about supplements or the grass he was eating. My lovely boy is now back into training and we are going to our first western show in eleven months in November. To finish off I just want to say when you have the dosage right DO NOT change it. Lucky had his dose rate cut back recently and within two days was short stepping and looking uncomfortable in the back end. I went back to the normal rate and all was great. He is on the full Gotcha Feed Plan. So I am very happy, my Lucky has gone from near retirement to full enjoyment and I am over the moon. Sharyn Kennedy - Somerville, Victoria.